Photo courtesy of Juan Perales. No reading this sign if you can’t read. No food if you don’t have food. I suppose diving is out of the question then. Drowning permitted. Please deposit valuables at front desk. Don’t you think that’s a little harsh..
How am I supposed to learn, then? I promise there will be no drowning if I can’t drown !! Our life-guards don’t respond to fake drowning, either. Hey, I can swim here for free!!! Could I just stand in the water and pee and fart? That’s all I wanted to do anyway. Is it OK if I lie on the bottom and drown then? What’s the policy on air-swimming? WARNING: I bet you can’t swiiiiimmmmmmmmm! chicken! CHICKEEEENNN!! No wading if you can’t wade. No dipping toes in water if they can’t get wet. If swim, water is relieving then. Otherwise it gets the stairs! and no warning if you can’t warn too! … and no smorking if you can’t smork! Swimming is free. It’s the drowning that they will charge you for! and remember, don’t fall into water carefully If you can’t fall. Also no skinny dipping if you’re wearing trunks. Can I just play with the water? Obviously this sign wasn’t posted in Louisiana where those six dumbass teens drowned. Atleast the parents where smart enough to let them drown because they couldn’t swim either! No singing if you can´t sing. This message brought to you by Captain Obvious of the Department of Redundancy Department. But isn’t this perfectly logical? How else would you phrase that? 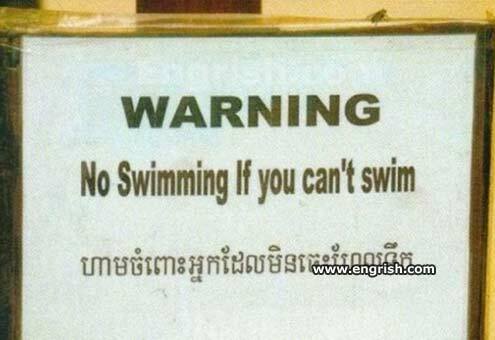 still doesn’t explain what they are warning them about, but at least it makes more sense than telling people who can’t swim – not to swim. No spreading wings if you cant fly. Can I at least drive?